In northern Washington state, the Pasayten Wilderness stands out. Its 530,031 acres of wild land buttress the Canadian border. It offers the promise of grizzly bear, lynx and wolf in the Pacific Northwest, and it has a unique geological history that left the area dotted with rare boreal hummocks. Even so, when Congress established the remote area as wilderness in 1968, it received little attention. George Wooten of the Kettle Range Conservation Group remembers the Pasayten "as our own secret wilderness - the last wilderness." Now, he says, "you can drop that. The Pasayten has been discovered." The Pasayten, like so many Western forests, has been discovered by recreationists; but its promise as an important low-elevation biological reserve has been discovered, too. And that has placed the Forest Service, which administers the Pasayten, in the middle of a sharp controversy over how to manage this tract of the Okanogan National Forest. The problem stems from a paradox rooted in the Wilderness Act of 1964: how to manage the National Wilderness Preservation System both for recreational use and as an ecological reserve. In the Pasayten, some say the Forest Service's bias has been made abundantly clear. For the past three summers, Martha Hall, a former schoolteacher from Anacortes, Wash., has painstakingly documented the threat that poorly managed recreation poses to the Pasayten's wilderness habitat. Hall is entranced with the Pasayten because she believes it "is one of the most valuable wilderness areas we have" for its biological diversity. But her field notes reveal a wilderness laced with eroding trails, pockmarked by overused campsites and sullied by trampled wetlands. With her evidence in hand, Hall has raised the alarm over backcountry conditions in the Pasayten. Hall's criticism, however, has not been limited to the Forest Service. She has taken on a well-entrenched tradition on the Pasayten: its community of commercial outfitters. The five outfitters on the Pasayten, with special permits from the Forest Service, advertise a cowboys' wilderness replete with rustic camps, roaring campfires and good hunting. While initial Forest Service research reports corroborate much of the overuse Hall has reported, all told the trampled trails, campsites, and wetlands add up to only a fraction of this large wilderness. To the horsepackers, those worn areas are like small stains on an old, familiar shirt. Claude Miller and Aaron Lee Burkhart, who each earn upwards of $3,000 in revenue every week that they pack customers into the backcountry, believe conditions on the Pasayten have improved recently. Until last year, sheep and cattle had grazed the Pasayten for decades, and the outfitters argue that much of the damage Hall has focused on is actually the legacy of that grazing. Miller is quick to criticize Hall's work on the Pasayten. Not only is she relatively new to the wilderness, he said, "she was hunting us, coming into our camps, and chewing out me and my guests." In July 2000, the Pasayten no longer seemed large enough to comfortably accommodate the different views of wilderness held by Hall and the packers. Hall ran afoul of one local horsepacker when she and her sister were spotted taking photographs in the backcountry. Hall says that the outfitter lost his temper, pushed her sister, and "kicked her backpack around like it was a football." The outfitter denies the allegations and counters that Hall and her sister had been impersonating Forest Service personnel. In turn, the five outfitters sued Hall for harassment, leading to a settlement and a restraining order requiring Hall to keep away from the packers' backcountry camps. In the middle of the controversy is the Forest Service, which is trying to balance recreation and ecology, says Jim Archambeault, a recreation planner for the Okanogan National Forest. Last summer, the Forest Service deployed botanists, range specialists and recreation specialists into the Pasayten to assess the wilderness area's condition. In the next few years, the agency must renew the packers' special-use permits and prepare a new management plan. Already, the Forest Service has begun to coordinate outfitters' backcountry itineraries and enforce limits on oversized parties. 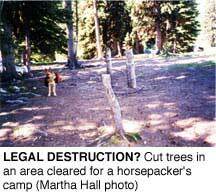 The agency has reintroduced wilderness permits and considered closing some campsites. "The (Forest Service) is pulling the present knowledge together, saying, ÔWe've got some problems on the Pasayten, and we are going to work on them,' " says Archambeault. Hall and regional conservationists say they are relieved to hear that the agency is trying to make some changes, but they worry that just changing management of the Pasayten won't get to the root of the problem: an agency policy that, historically, has ignored ecology. At the Forest Service, wilderness management falls under the Division of Recreation at both the national and regional level. "There is very little in existing Forest Service management that seeks to promote the ecological values of wilderness," says Andy Stahl, executive director of the Forest Service Employees for Environmental Ethics. Since the Wilderness Act passed in 1964, environmental groups have expended most of their energy acquiring new wilderness lands. Now that the National Wilderness Preservation System includes over 105 million acres, some groups say the environmental movement should start to focus on resource management. "Grazing, timbering and mining are on the way out," says George Nickas of Wilderness Watch. "But recreation demand is going to grow and grow and grow." In the long term, he says, "that poses a much greater risk to changing the character of our public lands than did all of those extractive industries of the past." The writer is a graduate student at Princeton University, working on a dissertation about the history of the National Wilderness Preservation System.